This is the fourth photograph in the series taken by balloon pilot Yuri Beydyk during the May 2000 festival at Kam'yanetz. Here the balloon has moved south and west. The camera is now aimed northwest.The castle is still in the senter of the photograph. But now we see the red sides of the Uniate church, whose white roof was so prominent in the previous photo. We also now can see the Polish suburb with the bluedomes of the church that was directly under the balloon previously. 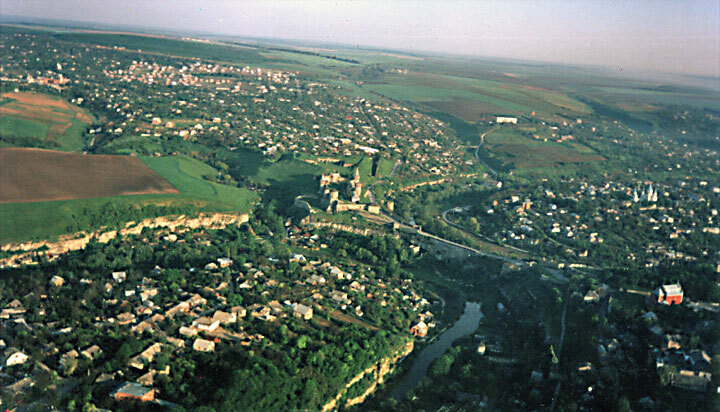 The Russian suburb is on the ridge extending from the bottom left corner of the photo toward the causeway bridge between the castle and old city. Just to the right of the Smotrich river in the shadow we see sunlight on part of the tower of the Russian gate which in medieval times was not only a gate into the city but also had a control mechanism for adjusting the level of the river.